The Jasper 350 tract is an excellent timber investment in that it contains pine plantations of various ages that have great access. It is close to wood-using mills and offers hunting in an area known for having high deer and turkey populations. The tract contains roughly 349.6 acres with approximately 339 forested acres. It is located in east central Jasper County near the Paulding community. It is about nine miles north of Heidelberg and 31 miles southwest of Meridian. The county seat of Bay Springs is about 17 miles west of the tract. Jasper 350 is about one mile northwest of the Jasper 120 tract, which is also for sale. The property has excellent access. County Road 16 forms most of the south boundary except for the square-shaped out piece which supports a radio station tower. County Road 1632 (gravel) runs about 30 feet west of and parallel to the west boundary, until it dead ends at a locked gate. A network of woods roads provides good interior access. The combination to the lock on the gate on County Road 16 is 4006. Numerous timber types are found on the property. Most of the tract is in merchantable loblolly pine plantations ranging from 18 to 29 years old. 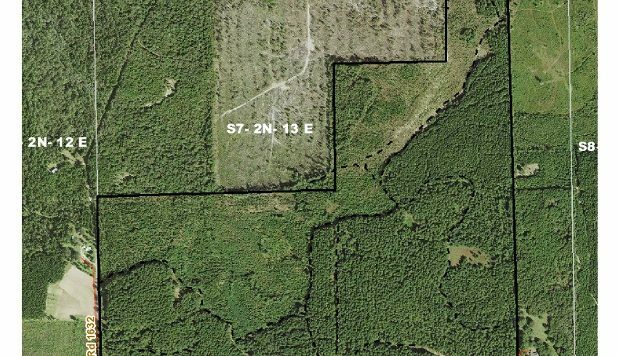 Additionally, there are 34 acres in pre-merchantable loblolly and 75 acres in longleaf pine that are both ten years old. The longleaf is planted on deep sandy soils that are well suited for growing longleaf. The longleaf plantation is in good condition and is doing well on this site. The loblolly plantations are in good condition on good sites. The property also supports five wildlife food plots that total about five acres. The topography is generally rolling to somewhat hilly. Total elevation change is 85 feet and ranges from 475 to 560 feet above sea level. A small drain runs northwest through the west half of the property. The topographic map indicates there are two very small ponds on the tract. The tract is situated in Section 7, Township 2 North, Range 13 East, Jasper County, Mississippi. The lat/long is 32.020691, -89.00667 for those who want to navigate using GPS.